For a richer show experience, please opt in to email sharing when you purchase your ticket. 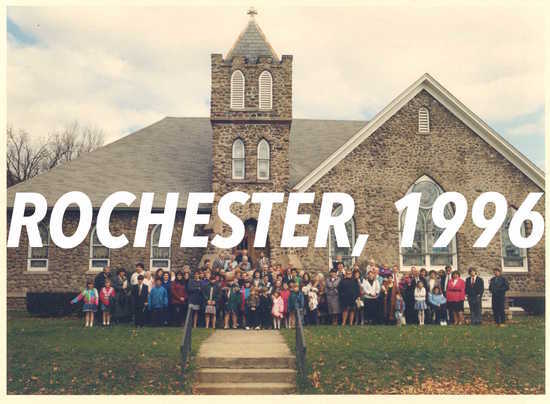 Rochester, 1996 is the story of an urban pastor, his teenage daughter, and a Sunday that shaped the rest of their lives. The show explores issues of identity, sexuality, and faith through the specific lens of late 90s Christianity in upstate New York. This is an immersive, interactive experience that takes between 2.5-3 hours and involves locations across Los Angeles, starting and ending at Thymele Arts. Participants will ride in a vehicle, talk to actors, stand, move, and walk through various locations. The show is not ADA accessible; we apologize for any disappointment or inconvenience. This is a play involving religion; not a religious play. People of all faiths and backgrounds are welcome. CW/DC offers immersive theatre experiences in which participants engage in physical activities. Audience members may be transported by bus, automobile, rickshaw, pedicab or like vehicles in order to participate in the theatre experience. Although CW/DC has taken reasonable steps to secure appropriate equipment and skilled staff, I acknowledge that the activities associated with CW/DC’s immersive experience has inherent risks, including those that cannot be eliminated. The risks of participating in the Activity include, but are not limited to damage to my physical property, accidental injury, or in extreme cases, permanent trauma or disability. CW/DC and their associated agents, members, employees, volunteers, members, officers, sponsors, clerics, elders, founders or any affiliated organizations assume no responsibility for providing for my medical insurance or medical treatment during the Activity, and I will pay for costs of any medical care and/or evacuation that I may incur. I hereby release CW/DC and all other Released Parties from all liabilities, causes of action, claims and demand that may arise in any way from any injury, death, loss or harm that occur to me during the Activity or related to the Activity, including during transportation to, from, or during the Activity. This release includes claims for negligence by all Released Parties and claims for strict liability or abnormally dangerous activities. This release does not extend to claims for gross negligence, intentional or reckless misconduct or any liabilities California law do not permit to be excluded by agreement. I also agree not to sue or make a claim for the released parties for death, injuries, loss or harm that occur during the Activity. I agree to indemnify, hold harmless and defense the Released Parties (as defined in section 2) against any and all claims to which Section 3 of this agreement applies, including claims for their own negligence. I also agree to indemnify, hold harmless and defense the Released Parties against any and all claims for my own negligence and any other claims arising from my conduct during the Activity. In accordance with this section, I will reimburse the Released Parties for any damages, reasonable settlements and defense costs, including attorney’s fees that they incur because of any such claims made against them. I agree that in the event of my death or disability, the terms of this agreement, including the indemnification obligation in this Section, will be binding on my estate, and my personal representative, executor, administrator or graduation will be obligated to enforce them. I agree to follow the rules and directions for the Activity provided to me, including wearing all required safety equipment. I understand that during this Activity, I may be photographed or videotaped for promotional use, both for CW/DC and for its associated sponsors and partners. To the extent allowed by law, I waive all rights of publicity or privacy or pre- approval that I have for such likeness of me or use of my name in connection with such likeness, and I grant CW/DC and its assigns permission to use, copyright and publish (including by electronic means) such likeness of me, whether in whole or in part, in any form, without restrictions and I expect no compensation for such use. I agree that the purpose of this agreement is that it shall be an enforceable release of liability and an indemnification as broad and inclusive as permitted by California state law. I agree that if any portion or provision of this agreement is found to be invalid or unenforceable, then the remainder will continue in full force and effect. I also agree that any invalid provision will be modified or partially enforced to the maximum extent permitted by law to carry out the purpose of the agreement. This agreement is governed by and shall be construed in accordance with the laws of the State of California, without any reference to its choice of law rules. I have fully informed myself of the contents of this agreement by reading it in its entirety before signing it. No oral representations, statements or other inducements to sign this release have been made a part from what is contained in this document.